Our range of products include ui type interlocked flexible metal tubing. With the help of our state-of-the-art infrastructure unit, we are able to manufacture the superlative quality of UI Type Interlocked Flexible Metal Tubing in variegated customized form in adherence with clients' specifications. 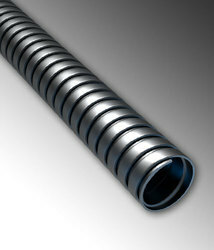 Offered tubing is designed using the best quality raw material and cutting edge technology. Apart from this, provided tubing is tested on diversified parameters under the vigilance of our quality experts to provide a flawless product at clients' end. Type UIH available in aluminum, galvanized steel, stainless steel, brass and bronze, unpacked - fully interlocked flexible tubing. .017" - .020" Metal. Inches Approx. Wgt. Per Foot, Lbs. Inside Diameter Inches Approx. Inches Approx. Wgt. Per Foot, Lbs. Looking for UI Type Interlocked Flexible Metal Tubing ?